Everything you need to know about the UConn Huskies as they begin the NCAA tournament. 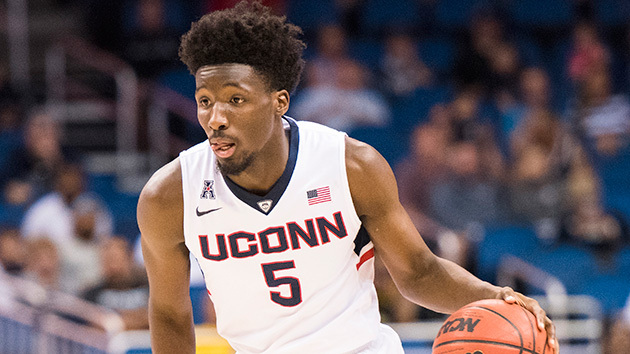 The Case For: It’s March, so of course the Huskies are surging. After topping Cincinnati in a four-overtime thriller, UConn topped Temple by 15 and Memphis by 14 to eliminate any Selection Sunday anxiety. The team relies on a trio of transfers on offense: former Cornell forward Shonn Miller (12.8 points), ex-NC State guard Rodney Purvis (12.5 points), and Sterling Gibbs (12.0 points), who previously played for Texas and Seton Hall, as well as sophomore Daniel Hamilton (12.5 points). Along with 7’0” Amida Brimah, those four contribute to a good-but-not-great offense that ranks between 50 and 100 in most categories. That is, except for free throw percentage, where UConn is No. 1 nationally at 78.5 percent. Defensively, Connecticut boasts the sixth stingiest unit in terms of effective field goal percentage. Inside the arc, opponents have shot just 41.4 percent (fifth nationally) and the Huskies have held opponents below 50 point four times this year. The Case Against: So why was UConn on the bubble before their AAC run? Though UConn has been elite at the free throw line, they have struggled to get there, ranking 334th in free throw frequency. And they failed to separate themselves from other good competition, finishing 9-10 against Top 100 teams. Their 234th ranked non-conference schedule also did them no favors in terms of impressing experts. Before getting hot in the conference tournament, Uconn had lost three of five. Backup guard Jalen Adams has been the teams most prolific threat off the bench, but he’s also proven streaky, with 0 and 2 point outings mixed in with the double-digit efforts he is capable of. On the glass the Huskies are average on both ends of the floor (185th on offense, 170th on defense). In their last loss, 80-54 at SMU, the Mustangs grabbed 10 offensive rebounds and only turned the ball over nine times, another area where UConn is just OK (159th nationally).